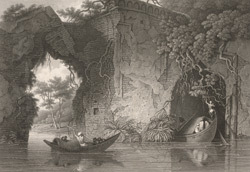 This etching was taken from plate 2 of Charles D'Oyly's 'Antiquities of Dacca'. "The bold and picturesque, though much shattered, ruins of Tungy Bridge have been thought to possess sufficient claims to its admission among our selection of Dacca antiquities. Its large masses are now fantastically overgrown with the wild roots and foliage of the banian tree." When Dhaka was a Mughal seat of government and at the zenith of its grandeur, this bridge was its northern limit and its southern limit was the Buriganga river, some fifteen miles away.